Anybody hanging around the pits of Team HARD may have heard one or two of their drivers comment as to how Donington will be the real early season tester for all the new cars on grid, and how they themselves actually relish competing on this circuit. Of course, it wasn’t long ago, just a few weeks in fact, when the season launch, or Media Day, was held at Donington and despite it being an opportunity for dry track testing, it was treated partly as a scouting mission to see what the rivals had developed ‘under the hood’ over the colder months. Team HARD themselves have always said that they have always had a soft spot for the Passat CC cars they were reunited with for this season, and with drivers; Hill, Epps and Burns they’ve surely got a cracking opportunity to show what they can do this coming weekend for Rounds 4-6 at one of their favourite tracks. Mike Epps in particular had a superb first round and having spoken to a lot of the drivers on the grid on Media Day amongst the kerfuffle of media, sponsors and fans, Mike Epps came across as (by far) one the most down to earth and composed. Then, there’s young Aiden Moffat of course. Aiden’s youth and exhilarance is infectious and despite being so young, at 20, he has more BTCC track time than a fair few of the other drivers lining up with him this weekend. His beautiful (and now repaired, since Round 1) Mercedes certainly also impressed at Donington during the test sessions on Media Day. Aiden’s strength then seemed to be his positioning into the corners and his faster exits but even since Media Day, his highly focused team (Laser Tools Racing) will have made further improvements to the car for the data logging in testing and during Rounds 1-3. 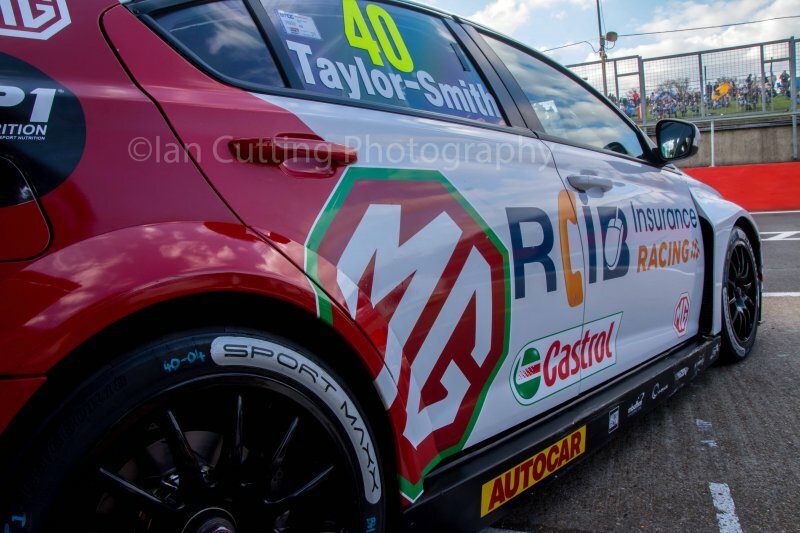 MG/Triple 8 Racing will be looking to prove a point at Donington. Early issues with cars seem to less of a problem now and Aron Taylor Smith was just a stones through from top 10 Round 1 finish at Brands Hatch. Drivers from all teams won’t forget that the last seasons title wasn’t even decided until the very last corner of the very last race (at Brands Hatch) so MG will literally be fighting for every single point, along with all others in Round 4-6. The weather forecast at the moment looks like probable dry weather for race day itself and perhaps a little rain for testing and qualifying meaning cars on track for the big day will need to be set up slightly differently between the 2 days. Photograph courtesy of Ian Cutting Photography.